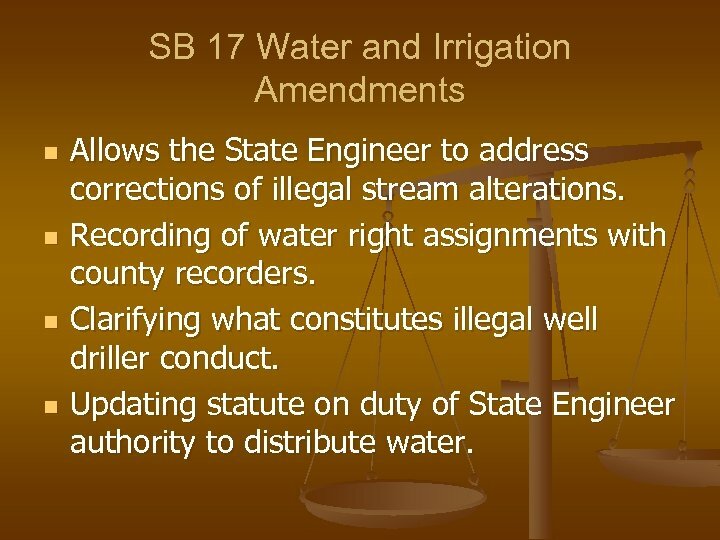 SB 17 Water and Irrigation Amendments n n Allows the State Engineer to address corrections of illegal stream alterations. Recording of water right assignments with county recorders. Clarifying what constitutes illegal well driller conduct. Updating statute on duty of State Engineer authority to distribute water. 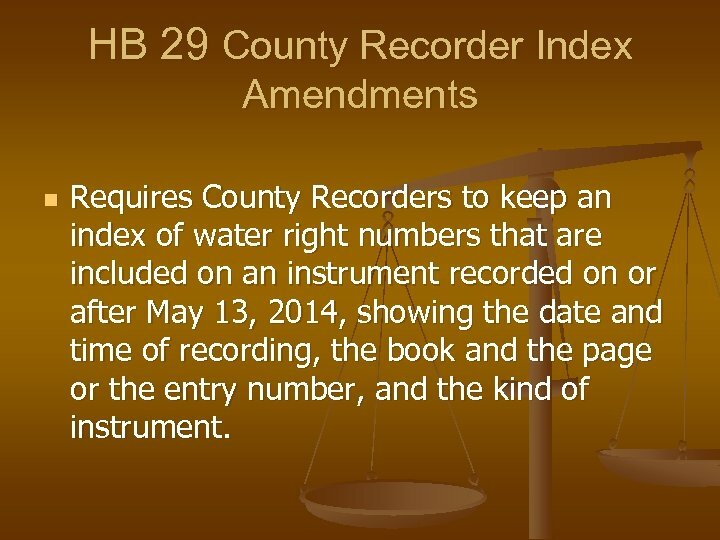 HB 29 County Recorder Index Amendments n Requires County Recorders to keep an index of water right numbers that are included on an instrument recorded on or after May 13, 2014, showing the date and time of recording, the book and the page or the entry number, and the kind of instrument. 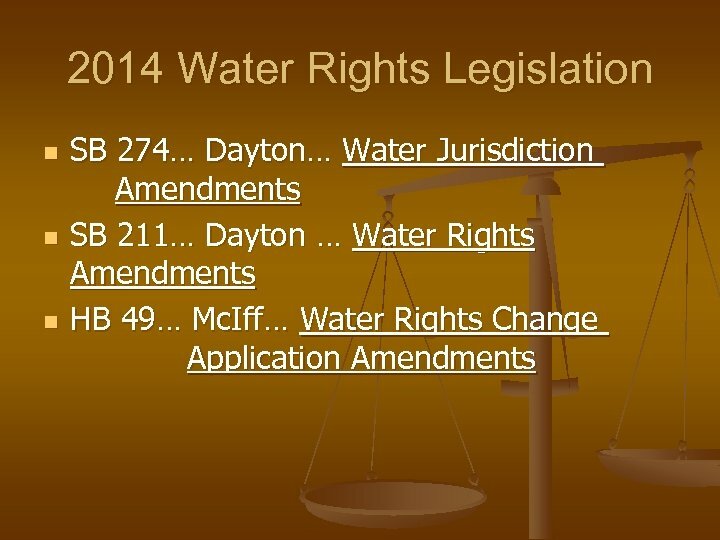 SB 274 Water Jurisdiction Amendments (cont. ) 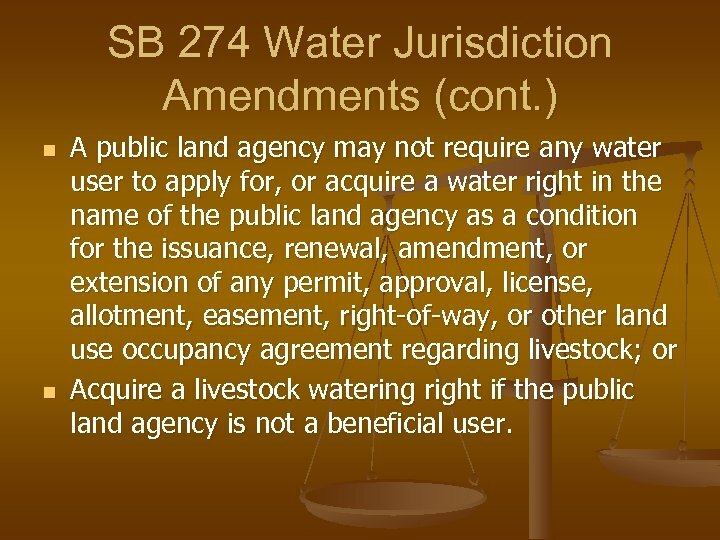 n n A public land agency may not require any water user to apply for, or acquire a water right in the name of the public land agency as a condition for the issuance, renewal, amendment, or extension of any permit, approval, license, allotment, easement, right-of-way, or other land use occupancy agreement regarding livestock; or Acquire a livestock watering right if the public land agency is not a beneficial user. 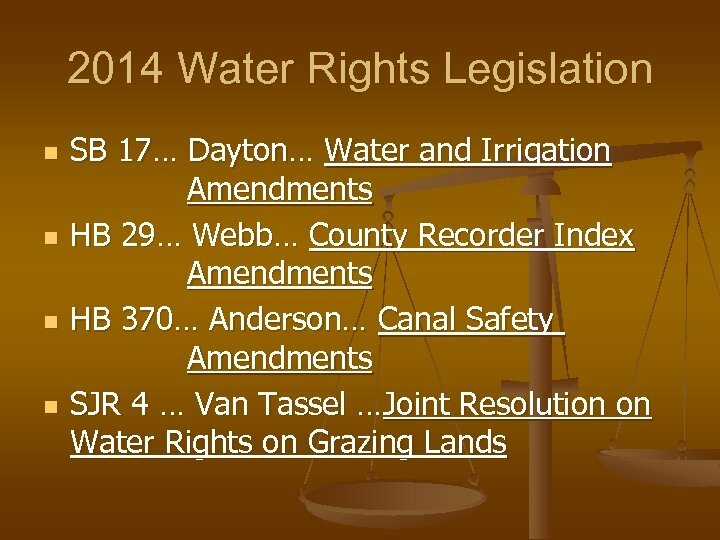 SB 274 Water Jurisdiction Amendments (cont. ) 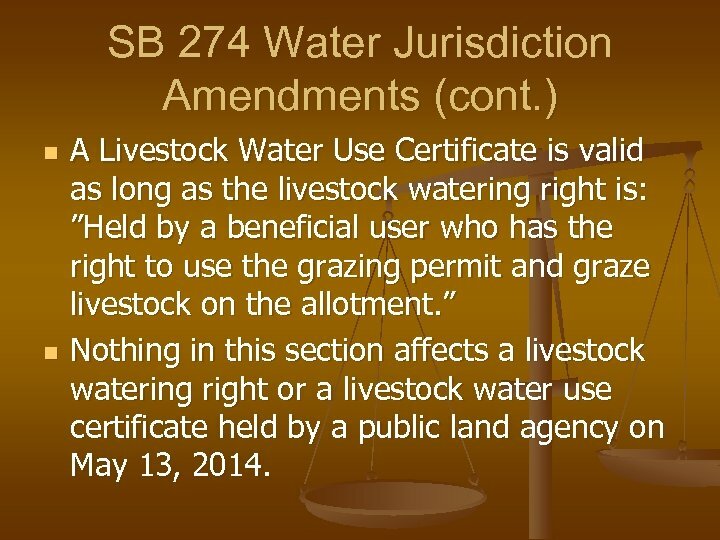 n n A Livestock Water Use Certificate is valid as long as the livestock watering right is: ”Held by a beneficial user who has the right to use the grazing permit and graze livestock on the allotment. 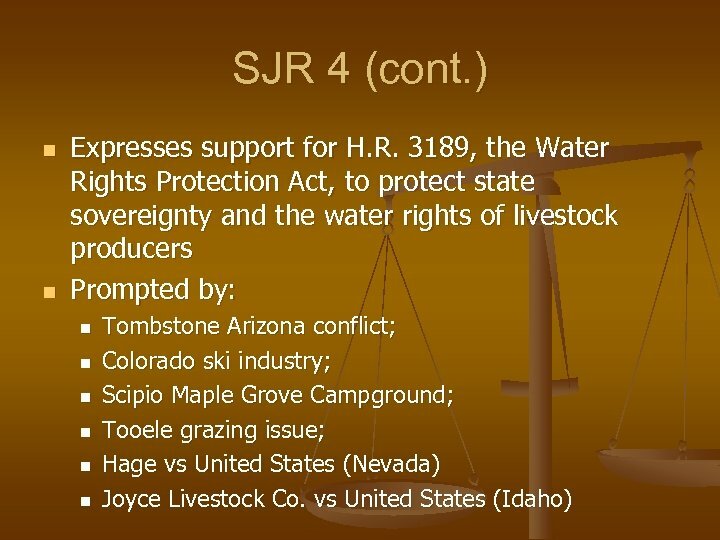 ” Nothing in this section affects a livestock watering right or a livestock water use certificate held by a public land agency on May 13, 2014. 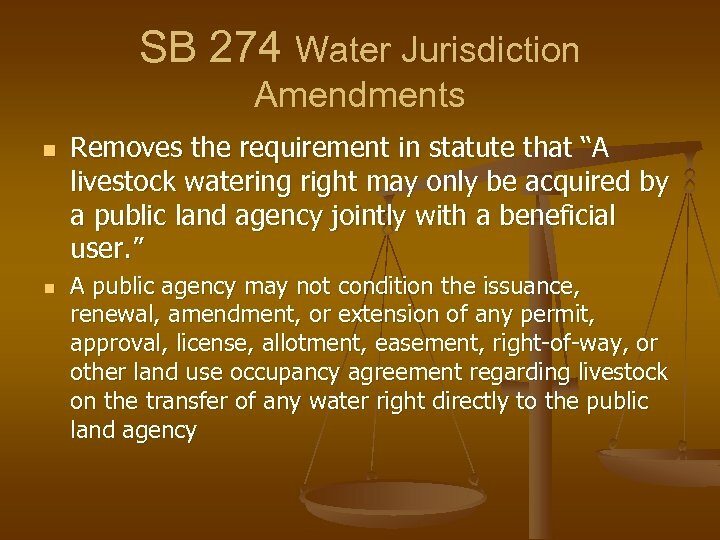 SB 274 Water Jurisdiction Amendments (cont. ) 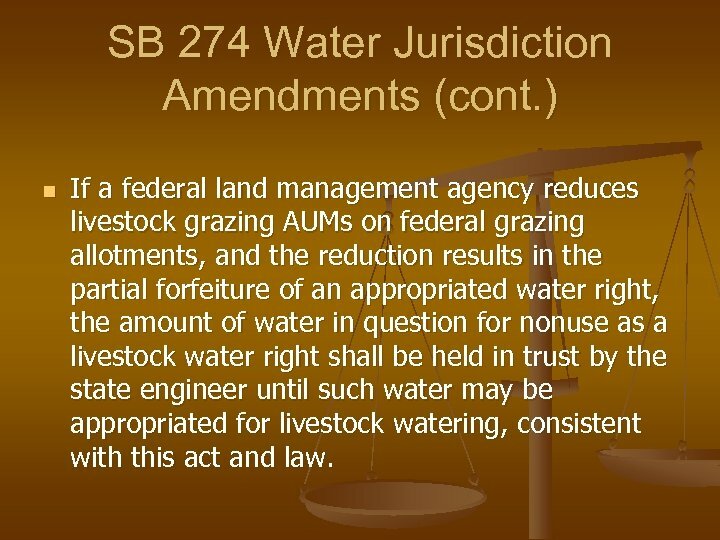 n If a federal land management agency reduces livestock grazing AUMs on federal grazing allotments, and the reduction results in the partial forfeiture of an appropriated water right, the amount of water in question for nonuse as a livestock water right shall be held in trust by the state engineer until such water may be appropriated for livestock watering, consistent with this act and law. 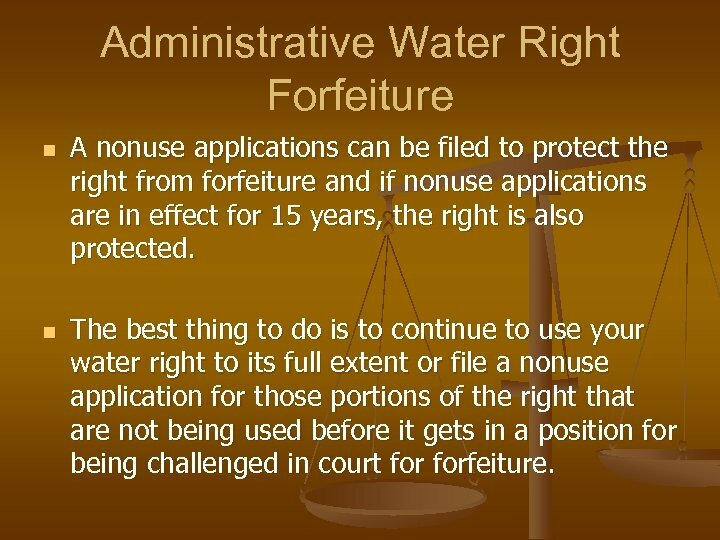 Administrative Water Right Forfeiture n n A nonuse applications can be filed to protect the right from forfeiture and if nonuse applications are in effect for 15 years, the right is also protected. 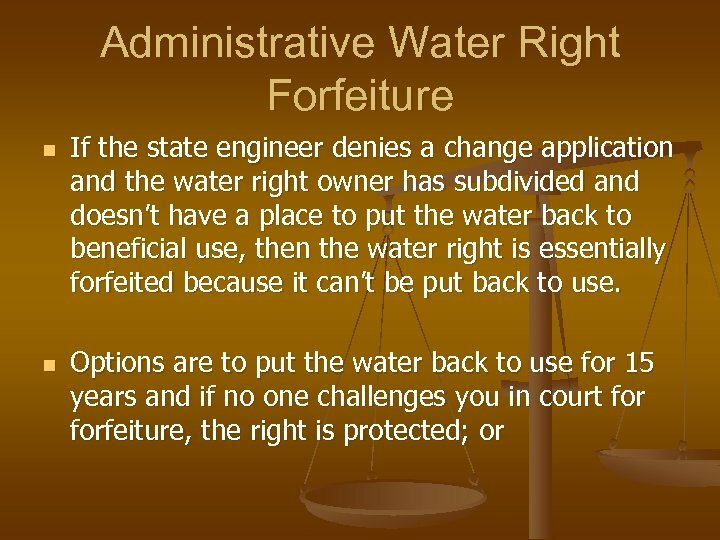 The best thing to do is to continue to use your water right to its full extent or file a nonuse application for those portions of the right that are not being used before it gets in a position for being challenged in court forfeiture. 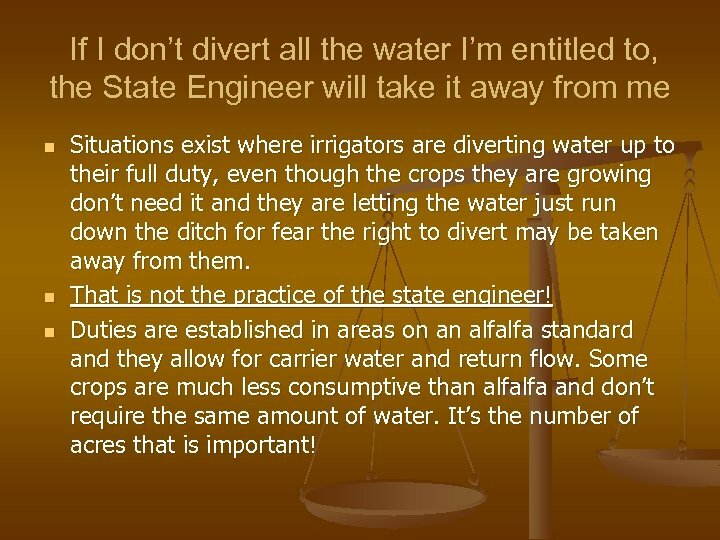 If I don’t divert all the water I’m entitled to, the State Engineer will take it away from me n n n Situations exist where irrigators are diverting water up to their full duty, even though the crops they are growing don’t need it and they are letting the water just run down the ditch for fear the right to divert may be taken away from them. That is not the practice of the state engineer! 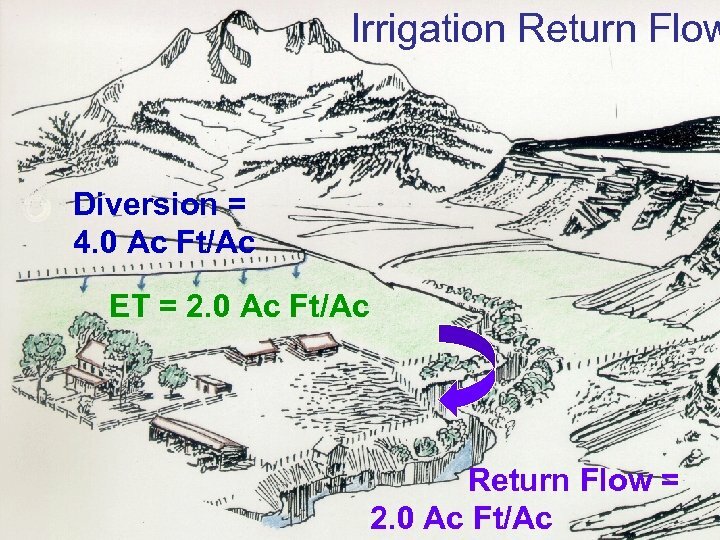 Duties are established in areas on an alfalfa standard and they allow for carrier water and return flow. Some crops are much less consumptive than alfalfa and don’t require the same amount of water. It’s the number of acres that is important! 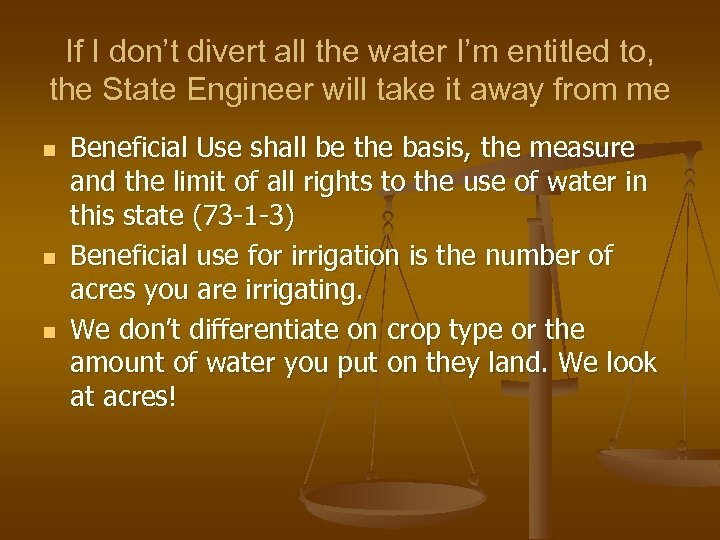 If I don’t divert all the water I’m entitled to, the State Engineer will take it away from me n n n Beneficial Use shall be the basis, the measure and the limit of all rights to the use of water in this state (73 -1 -3) Beneficial use for irrigation is the number of acres you are irrigating. We don’t differentiate on crop type or the amount of water you put on they land. We look at acres! 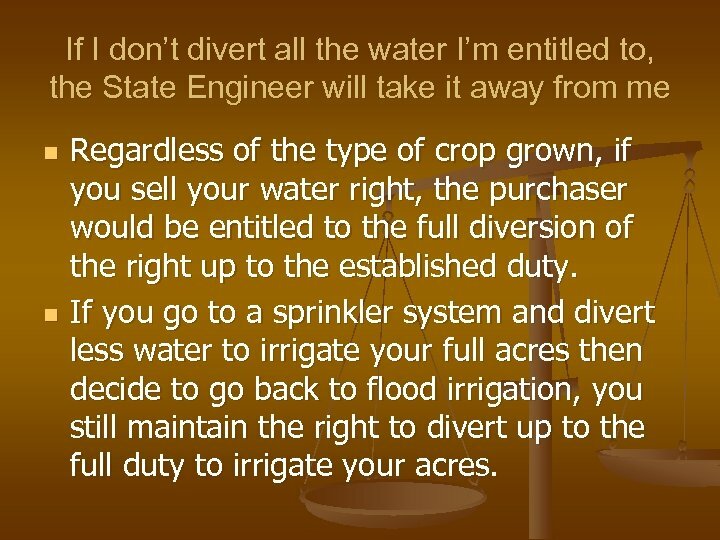 If I don’t divert all the water I’m entitled to, the State Engineer will take it away from me n n Regardless of the type of crop grown, if you sell your water right, the purchaser would be entitled to the full diversion of the right up to the established duty. 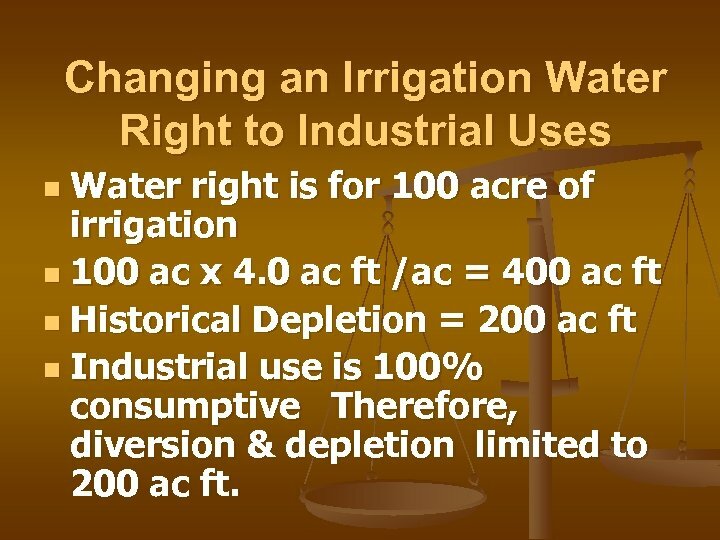 If you go to a sprinkler system and divert less water to irrigate your full acres then decide to go back to flood irrigation, you still maintain the right to divert up to the full duty to irrigate your acres. If I don’t divert all the water I’m entitled to, the State Engineer will take it away from me n n Opportunity is given to divert up to the full duty if the water is available and needed but it is not required to be diverted if it isn’t needed. 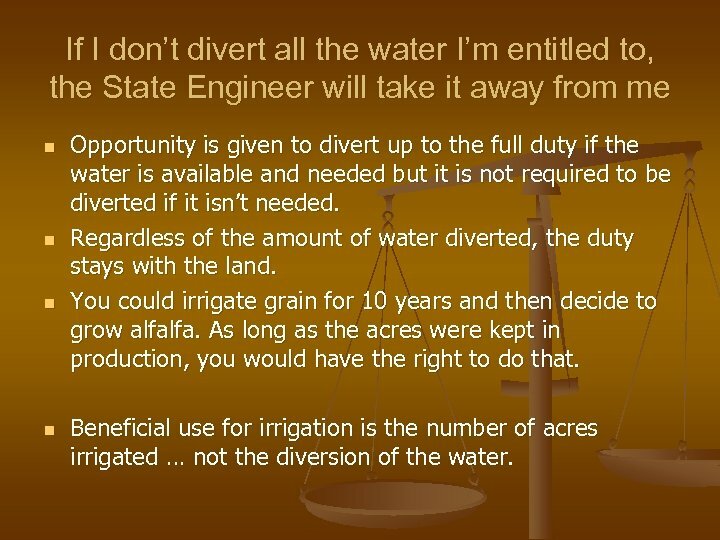 Regardless of the amount of water diverted, the duty stays with the land. You could irrigate grain for 10 years and then decide to grow alfalfa. As long as the acres were kept in production, you would have the right to do that. 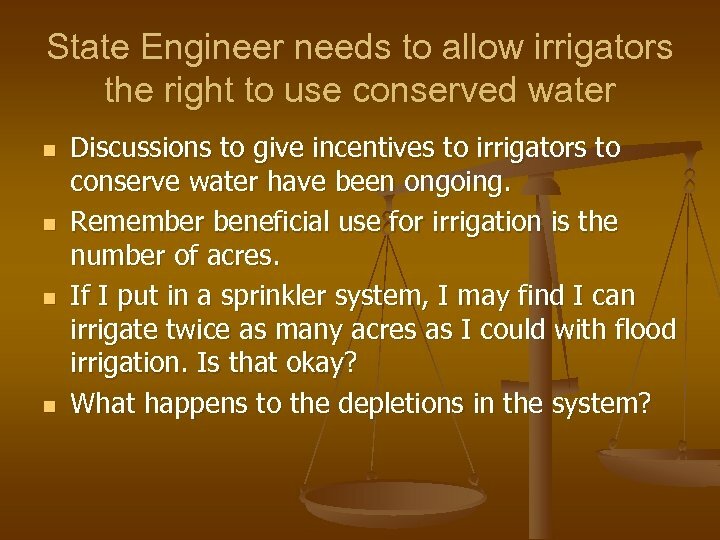 Beneficial use for irrigation is the number of acres irrigated … not the diversion of the water. State Engineer needs to allow irrigators the right to use conserved water n n Discussions to give incentives to irrigators to conserve water have been ongoing. 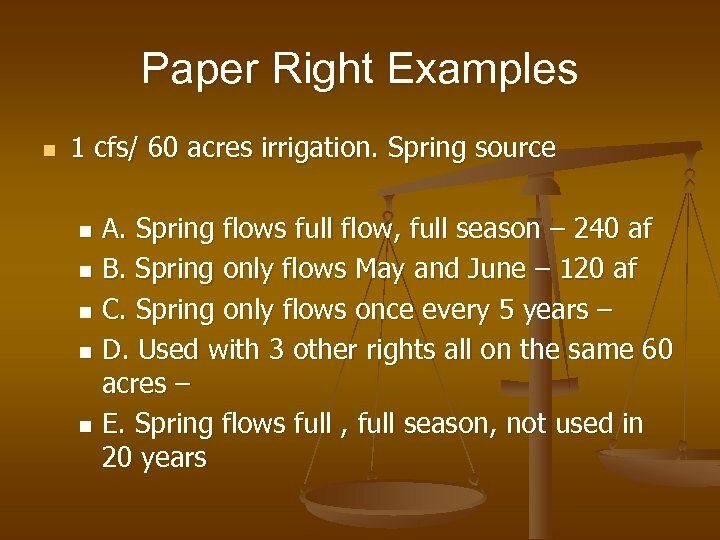 Remember beneficial use for irrigation is the number of acres. If I put in a sprinkler system, I may find I can irrigate twice as many acres as I could with flood irrigation. Is that okay? 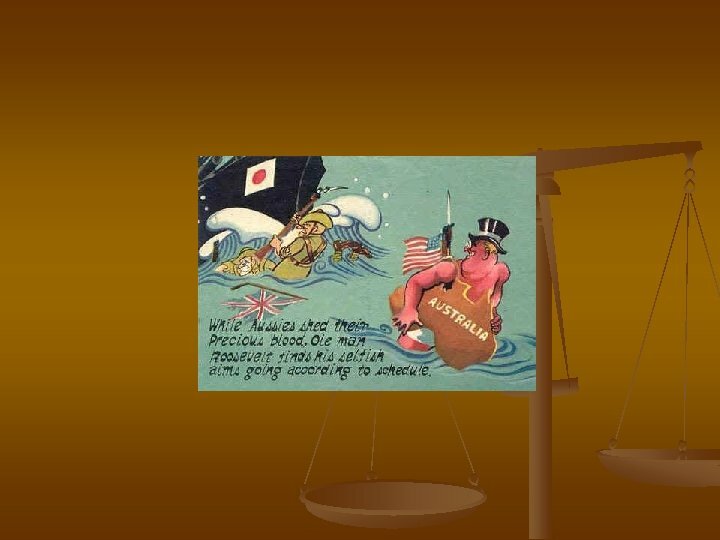 What happens to the depletions in the system? 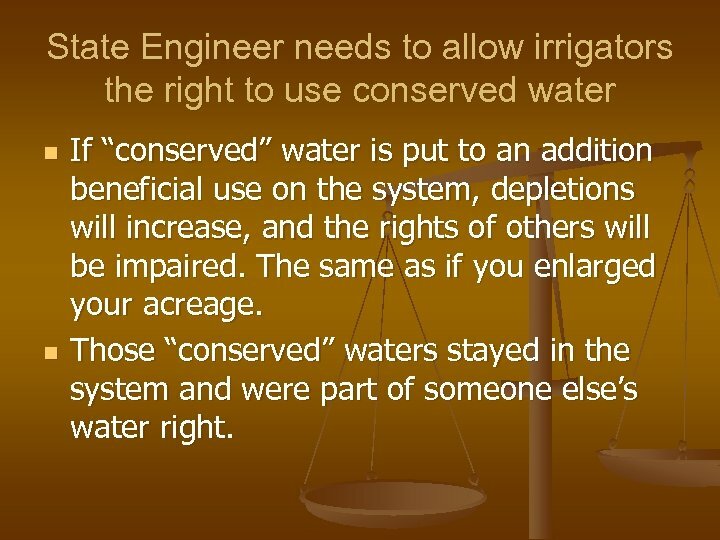 State Engineer needs to allow irrigators the right to use conserved water n n If “conserved” water is put to an addition beneficial use on the system, depletions will increase, and the rights of others will be impaired. The same as if you enlarged your acreage. Those “conserved” waters stayed in the system and were part of someone else’s water right. State Engineer seeking to affirmatively eliminate excess water rights n n n Assertion that the state engineer is trying to make up for past mistakes of over appropriating water basins. 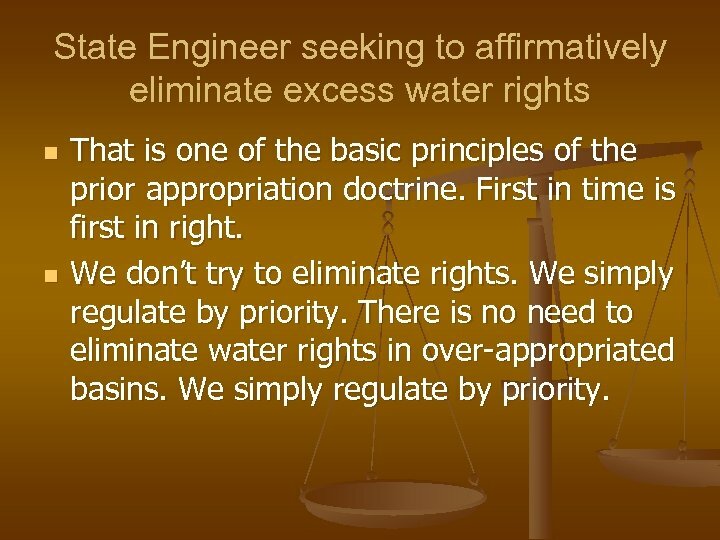 Past state engineers have routinely approved water rights where it is observed that there is water available for use. On paper, that may over allocate the available water. But until it is all used someone with a need should be able to use it. 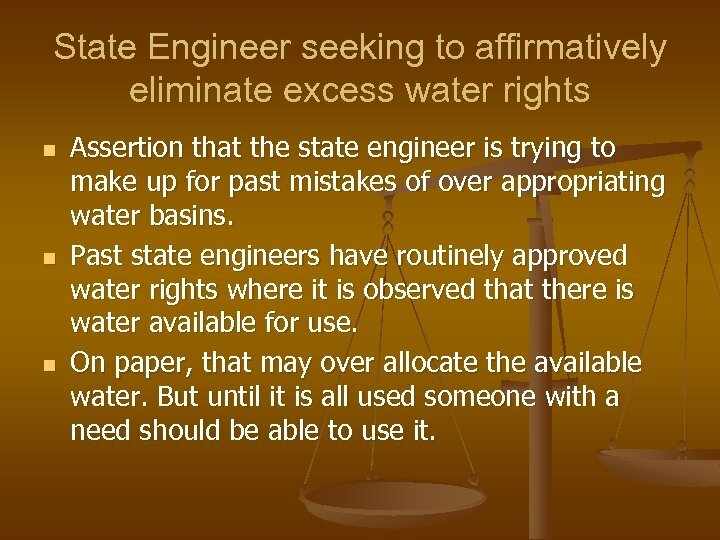 State Engineer seeking to affirmatively eliminate excess water rights n n That is one of the basic principles of the prior appropriation doctrine. First in time is first in right. We don’t try to eliminate rights. We simply regulate by priority. 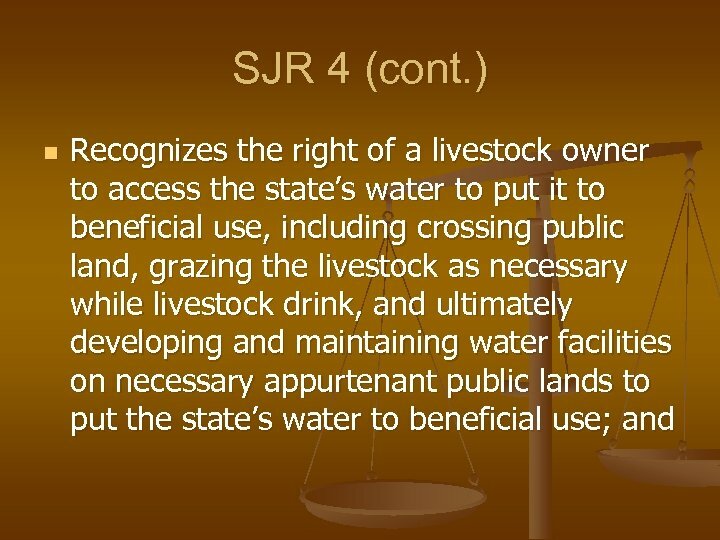 There is no need to eliminate water rights in over-appropriated basins. We simply regulate by priority. 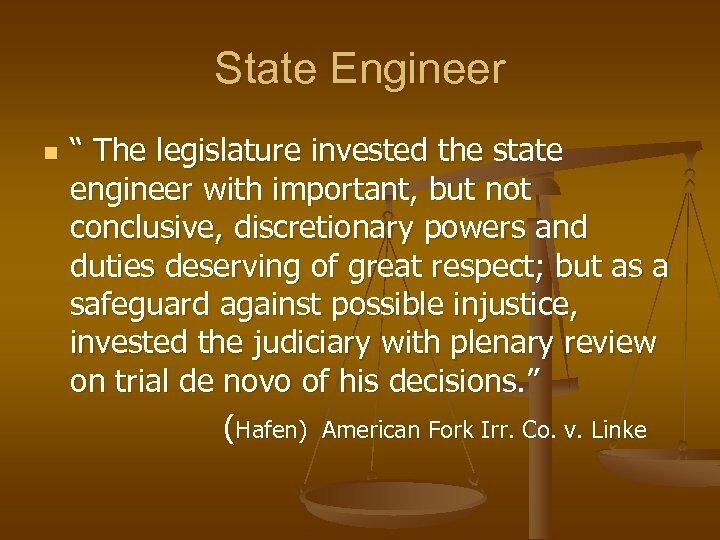 State Engineer is the Judge, Jury, and Executioner n n Concern has been expressed that the state engineer’s processes don’t allow for legal due process. 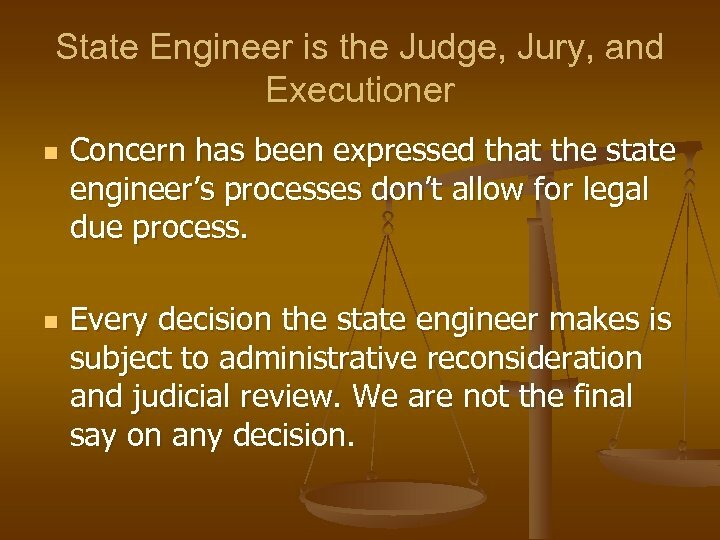 Every decision the state engineer makes is subject to administrative reconsideration and judicial review. We are not the final say on any decision. 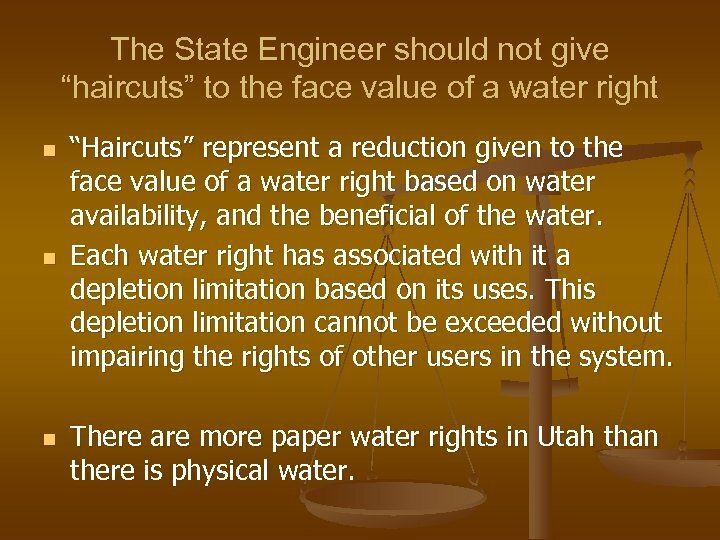 The State Engineer should not give “haircuts” to the face value of a water right n n n “Haircuts” represent a reduction given to the face value of a water right based on water availability, and the beneficial of the water. Each water right has associated with it a depletion limitation based on its uses. 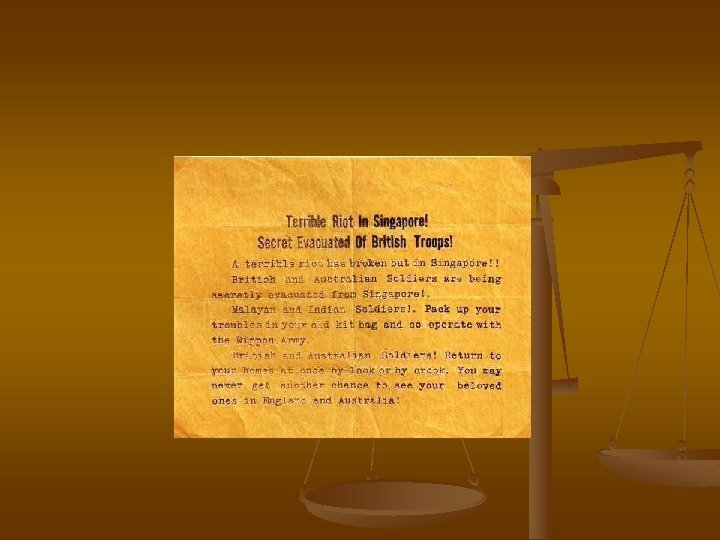 This depletion limitation cannot be exceeded without impairing the rights of other users in the system. 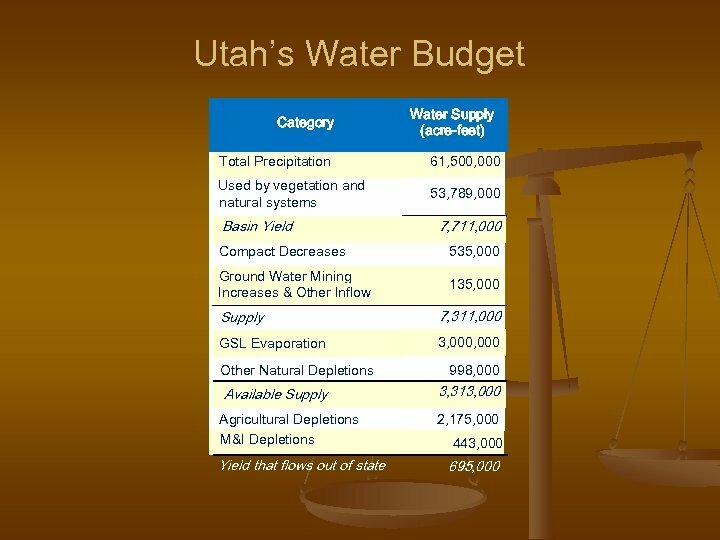 There are more paper water rights in Utah than there is physical water. Evaluation of a Water Right n n n Major Elements Flow: 2. 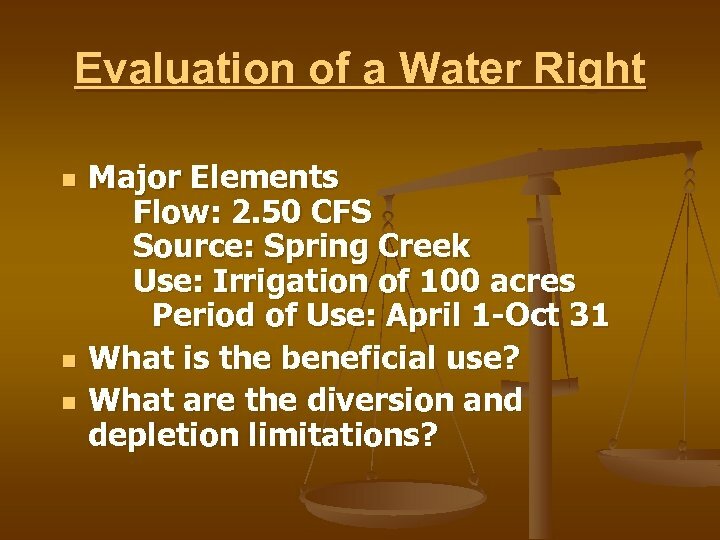 50 CFS Source: Spring Creek Use: Irrigation of 100 acres Period of Use: April 1 -Oct 31 What is the beneficial use? 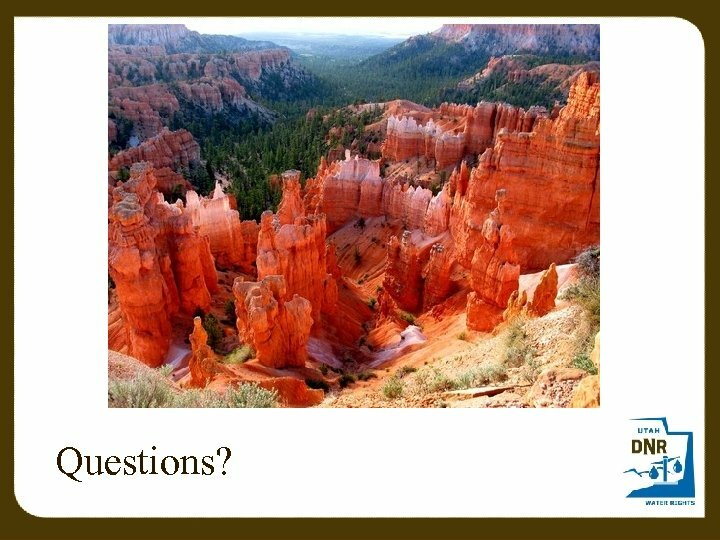 What are the diversion and depletion limitations? 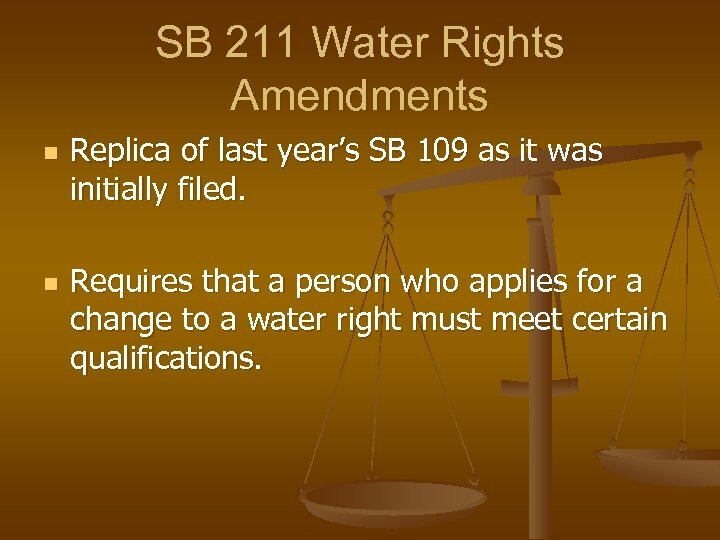 SB 211 Water Rights Amendments n n Replica of last year’s SB 109 as it was initially filed. Requires that a person who applies for a change to a water right must meet certain qualifications. SB 211 (cont. ) 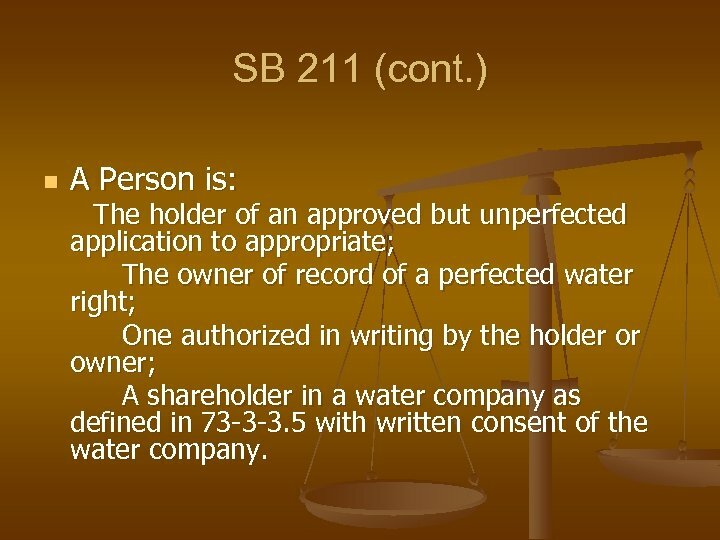 n A Person is: The holder of an approved but unperfected application to appropriate; The owner of record of a perfected water right; One authorized in writing by the holder or owner; A shareholder in a water company as defined in 73 -3 -3. 5 with written consent of the water company. SB 211 (cont. ) 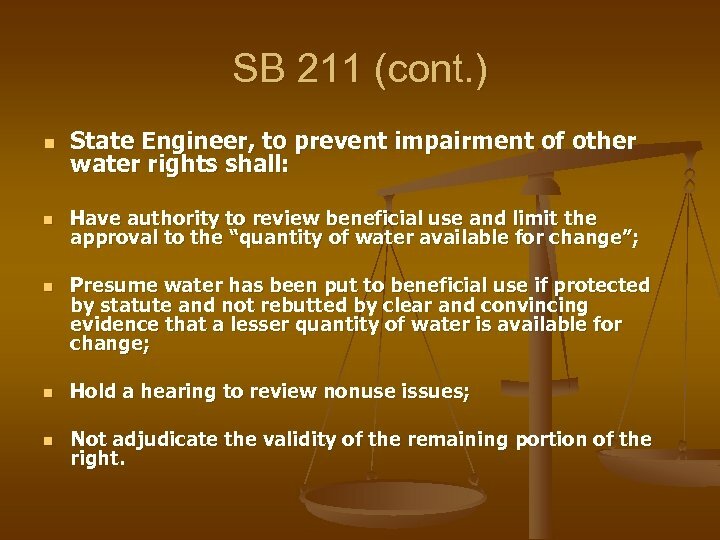 n n n State Engineer, to prevent impairment of other water rights shall: Have authority to review beneficial use and limit the approval to the “quantity of water available for change”; Presume water has been put to beneficial use if protected by statute and not rebutted by clear and convincing evidence that a lesser quantity of water is available for change; n Hold a hearing to review nonuse issues; n Not adjudicate the validity of the remaining portion of the right. 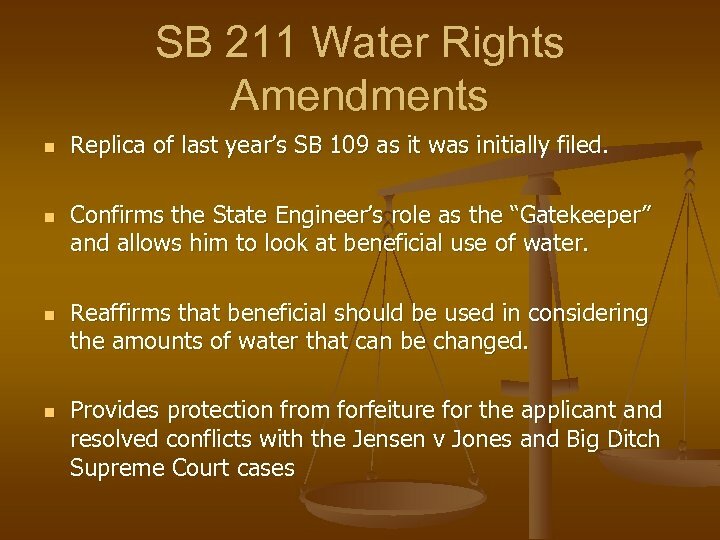 SB 211 (cont. ) 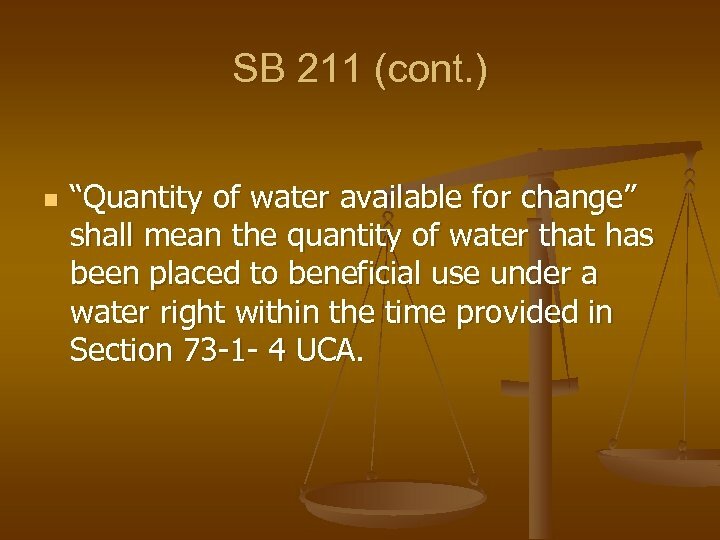 n “Quantity of water available for change” shall mean the quantity of water that has been placed to beneficial use under a water right within the time provided in Section 73 -1 - 4 UCA. SB 211 (cont. ) n n The applicant has the right to withdraw the application, request a stay of action, or pursue litigation to determine the validity of the right. 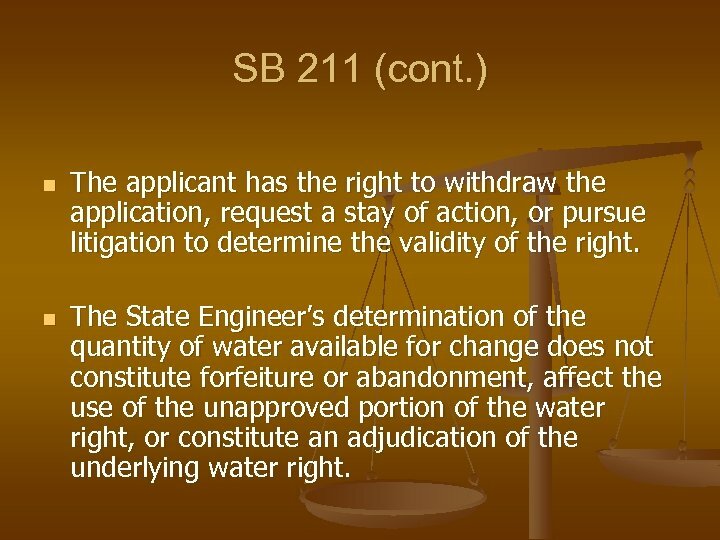 The State Engineer’s determination of the quantity of water available for change does not constitute forfeiture or abandonment, affect the use of the unapproved portion of the water right, or constitute an adjudication of the underlying water right. n n n municipal change application system as its weapon of water rights destruction. As a result, the entire “over appropriation” debacle that was created by the state engineer’s office will be paid for exclusively by municipalities, or the developers who wish to develop in them. The ULCT and the Property Rights Coalition agree that it is time to rationalize, objectify and streamline the change application process to remove this unilateral threat from the current land development system. While nebulous rules and the good faith of the staff in the state engineer’s office once worked when water rights were valued at $200 per acre foot, the market for water rights has exceeded $35, 000 per acre foot. Too much is at stake here to allow limitless government discretion to persist. 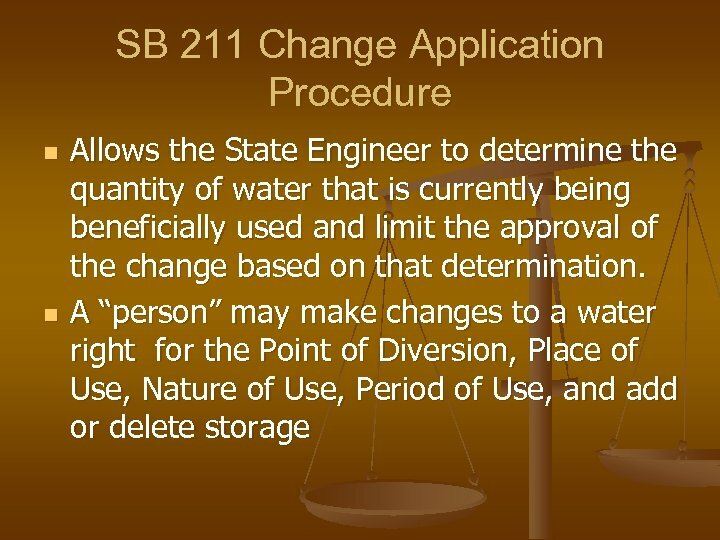 One step in the right direction would be to define the state engineer’s role in each of the four change application inquiries: What is the conversion factor (“haircut”) that the state engineer can use in converting a seasonal flood irrigation right into a year round use? Given that 90% of the municipal use is in during the irrigation season, should the haircut be limited to 10%? 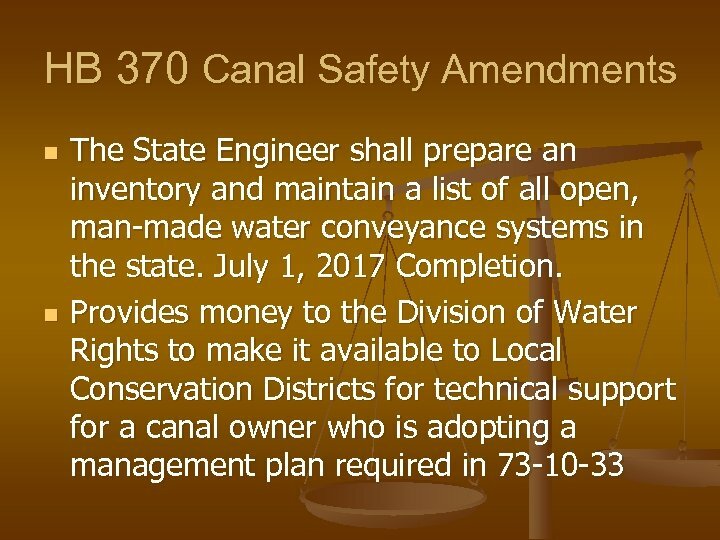 (Currently, a haircut can cost 50%); Should the state engineer be involved in limiting a point of diversion or a place of use without an actual protest of area water rights holders? 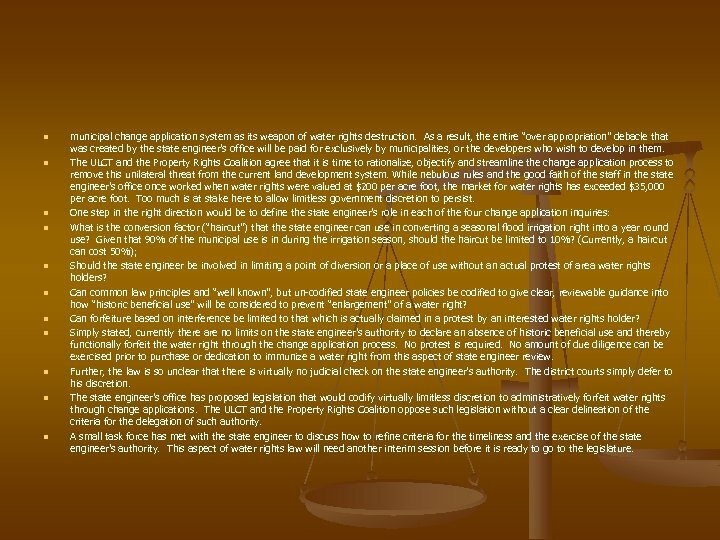 Can common law principles and “well known”, but un-codified state engineer policies be codified to give clear, reviewable guidance into how “historic beneficial use” will be considered to prevent “enlargement” of a water right? 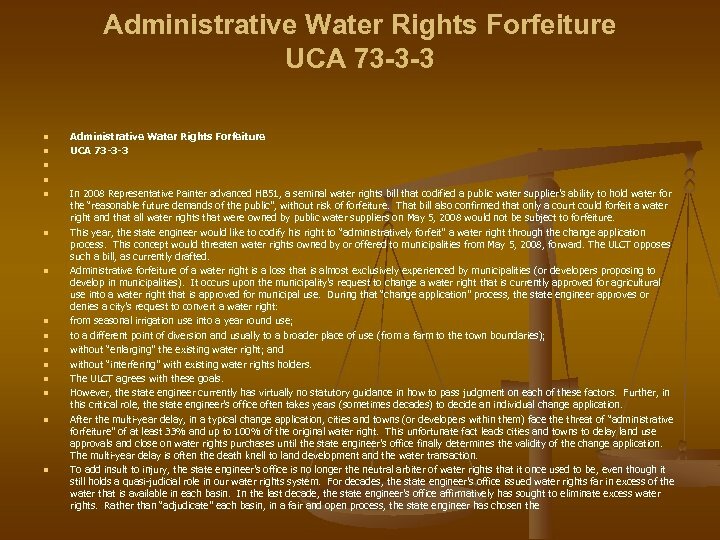 Can forfeiture based on interference be limited to that which is actually claimed in a protest by an interested water rights holder? 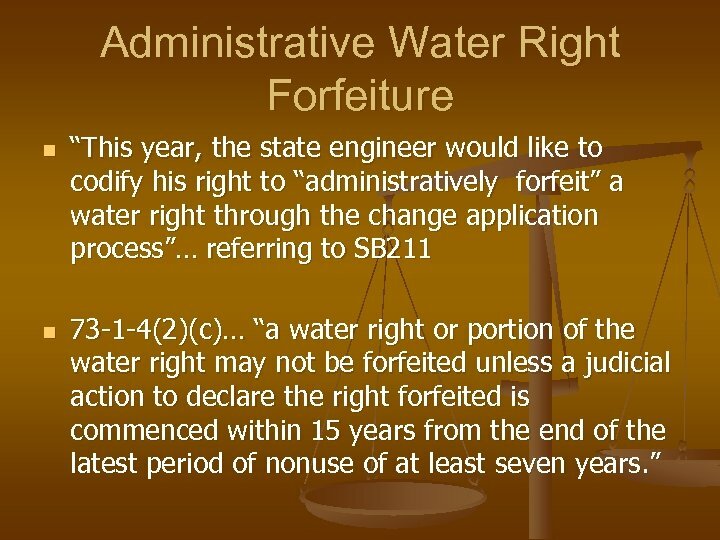 Simply stated, currently there are no limits on the state engineer’s authority to declare an absence of historic beneficial use and thereby functionally forfeit the water right through the change application process. No protest is required. 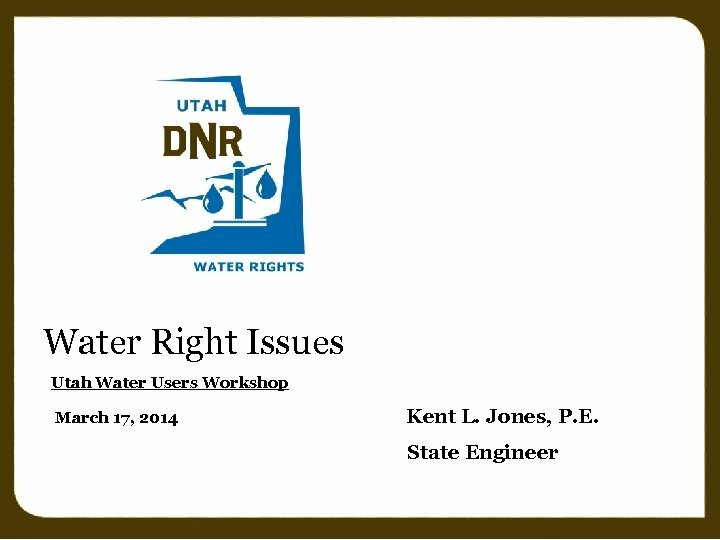 No amount of due diligence can be exercised prior to purchase or dedication to immunize a water right from this aspect of state engineer review. Further, the law is so unclear that there is virtually no judicial check on the state engineer’s authority. The district courts simply defer to his discretion. 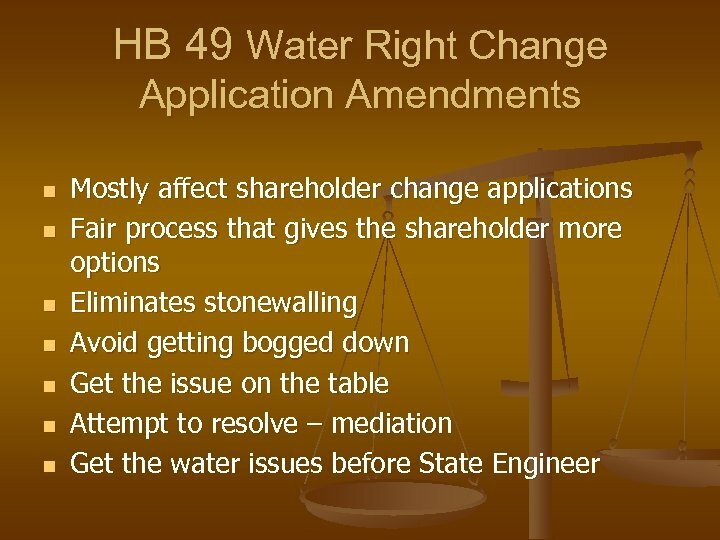 The state engineer’s office has proposed legislation that would codify virtually limitless discretion to administratively forfeit water rights through change applications. The ULCT and the Property Rights Coalition oppose such legislation without a clear delineation of the criteria for the delegation of such authority. A small task force has met with the state engineer to discuss how to refine criteria for the timeliness and the exercise of the state engineer’s authority. 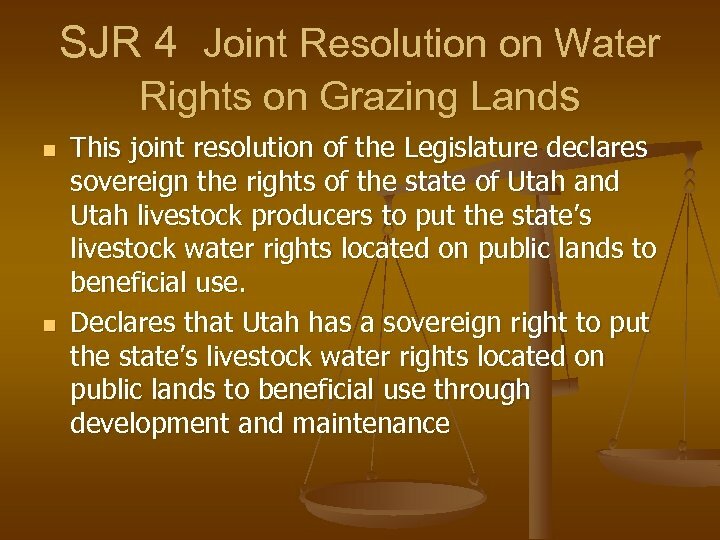 This aspect of water rights law will need another interim session before it is ready to go to the legislature.